For some peculiar reason, Netatmo don’t have an OSX app for viewing their devices (however their iOS one is simply brilliant). So, me being me, I wrote one. Very simple app to put together in fact (but then, it doesn’t do all the fancy history stuff that the iOS one does). Free and without any warranty of any kind. OSX 10.7 and 10.8 only – afaik it will not work on 10.6. Double-click to run it. If you get a gatekeeper warning, right-click, open and click ok for the warning. 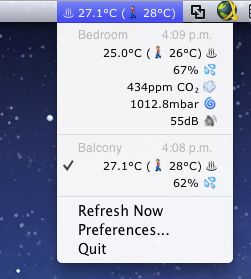 A little blue windchime ( – yes, that’s a windchime) will appear in your menu bar. Click it, then select the ‘Preferences’ menu item. Click ‘Refresh Now’ to force an immediate refresh. If your login details are correct the menu should populate within a few seconds with the latest measurements (similar to the screenshot above). If you would like to display one of the measurement directly in the menu bar, click it in the menu. No warranty of any kind. I’d be mildly curious if it doesn’t work for anyone, but that doesn’t mean I’m going to fix it. Please don’t ask for enhancements, as being completely ignored may cause offence. The little walking man in the temperate is to show the ‘Heat Index’. This is based on the formula in the wikipedia page for same, and I can only assume it’s correct (and it’s a far more accurate sensation measurement that the one that the Netatmo app uses I think). It will only be shown if it differs from the normal temp value. This is actually a trimmed down version of what I use myself (my own version reads data from other realtime sources also), so I guess I’ll be updating it occasionally as I find bugs. Seriously – no feature requests please. Bad things will happen to you. Update: I decided to google ‘Netatmo Menu Bar app’ just after writing this post, and it seems there’s a much better one already available from someone else! See here: http://forum.netatmo.com/viewtopic.php?f=5&t=1048. Obviously you should use their one. It’s better. This entry was posted on March 29, 2013, 7:09 pm and is filed under Mac, Programming. You can follow any responses to this entry through RSS 2.0. You can leave a response, or trackback from your own site. Thanks for the work, your widget is better than Baratmo because it’s free and gives all we need. Thanks for the work again ! Would you mind freeing the code ? A free hosting git repository would be nice. Is it possible to have the source code ? That’s better than the baratmo because it’s free !!!! Any ideas if you have plans for a refactor of the code to make it work on OSX 10.10.4? Unfortunately I don’t use this any longer (the netatmo is too inaccurate to be useful). I’m travelling currently (so I don’t have access to my backups), but if I can find the code next week (a big “if”!) I’ll remove my private api from it and open source it. Time machine only keeps the backups for a few months, and this is going back much further than that. However, if you have any coding experience, this was a very easy app to write – iirc it only took an hour or two (and I have little to no osx desktop app experience). did your app run on Mac OS high Sierra ? i install it but it appears no response. Hi, thanks again for this tool. Its runs perfect on mojave! P.S. Would it be possible to change time-format to 24h instead of 12h (with AM/PM)?